Ahem. Right. 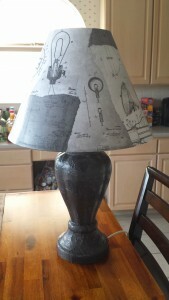 So I decided to (with his permission of course) decoupage the lamp. I know, that had a twist ending that nobody saw coming, right? Anyway, I think it turned out really well! I tried my very hardest to make it more masculine themed, which is quite frankly kind of difficult to do with anything that you’re decoupaging. Mainly because decoupaging just seems so…girly. I’m fairly confident that I succeeded though, and here’s the pic so you can judge for yourself. I honestly wish I had thought about it enough to take a before pic as well, so it would possibly be a little more impressive to you. For anyone who really likes the look but has no experience with this particular craft, just message me – I’d be happy to give you some pointers to get you started. All in all though, I think that decoupage is a really fun and easy way to completely change the look of something, for very little money. Seriously. Very little money. So long for now, and may you never have an unsightly light fixture!